This book is amazing. Just absolutely amazing. 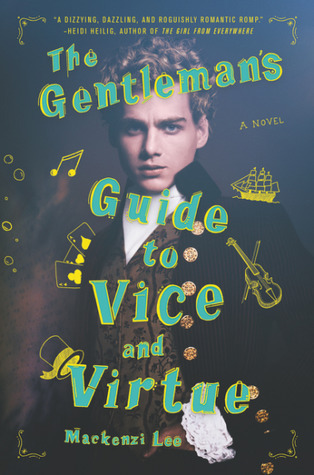 The Gentleman’s Guide to Vice and Virtue follows Henry “Monty” Montague as he, his bookworm sister, and his best friend/unrequited love Percy as they travel across Europe and get into involved in all kinds of chaos. From the second I heard about this book, I knew I would fall in love with it. And I 100% did exactly that. First, can we talk about the writing? Mackenzi Lee. Oh my god you are amazing. The witty dialogue and excellent prose made this book shine, leading to both laugh-out-loud moments and heart wrenching scenes. I don’t know how this book could make me feel so many things, but it did. Whenever I pitch this book to my friends, I describe it as a “gay 18th-century European road trip” and honestly if that doesn’t pique your interest I don’t know what will. The plot is fast as our heroes travel across the continent, and there is never a dull moment with these characters. From pirates to highwaymen, a lot of interesting shenanigans occur (sidenote: can we make shenanigans a more frequently used part of everyone’s vocabulary? This is my life goal). The characters are really what make this book memorable. As I mentioned, this is an LGBT read, with our protagonist, Monty, being bisexual (YAY BISEXUAL REP!). I love how they handled his sexuality while also being realistic for the time period. Monty, in general, is just a fun character, who is a bit of a disaster but I still love him, how can you not? Felicity and Percy were also amazing, all well-developed and relatable in their own way while being unique and memorable. All of their arcs, especially Monty’s, are amazing to witness. I also adored the relationships (both romantic and platonic) that grew over the course of this book. It was just so cute and fun. Cons– ???? It ended ???? The Gentleman’s Guide to Vice and Virtue has reached all-time favorite status for me. This book was perfection and I can’t recommend it enough.